My brother needed to upgrade his septic system. Price one out, it’ll be good for a laugh. It seemed like he could either spend a bunch of money, and have the basic work done for a functioning system, or he could spend more or less the same amount, buy some equipment, and do it himself. 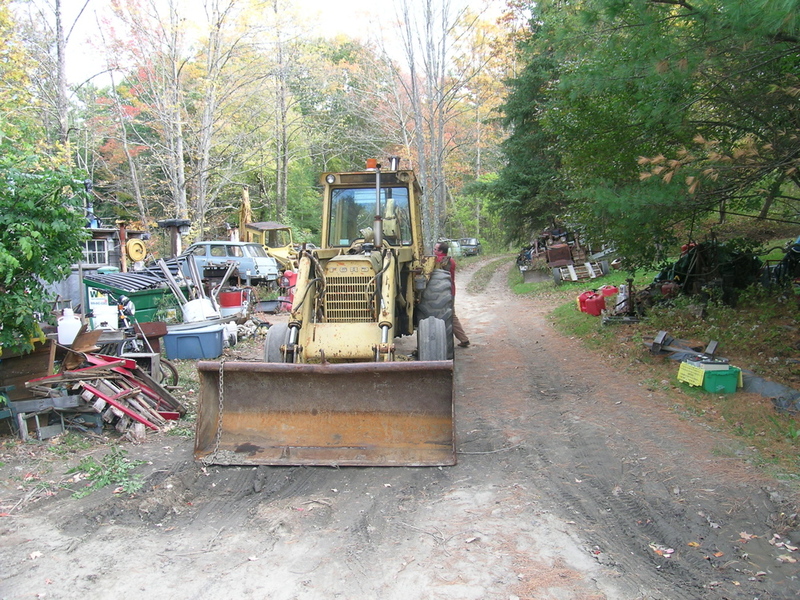 The latter was more appealing, in that the funds expended would provide not only a septic system, but the machinery to do further landscaping to both the septic area, and the rest of his property. So the search was on for some usable iron. A turn-key hoe, needing no work, should be fairly expensive. 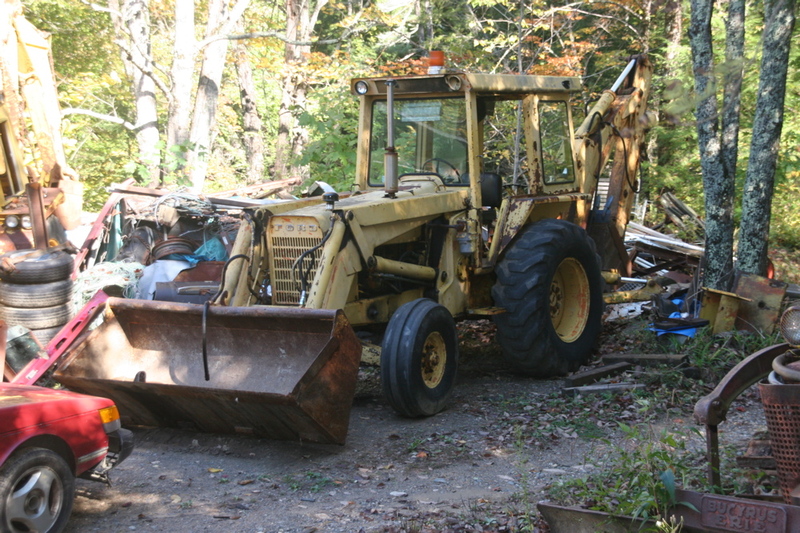 And nobody ‘gives away’ a backhoe unless it needs significant work. Our target was somewhere in the middle. 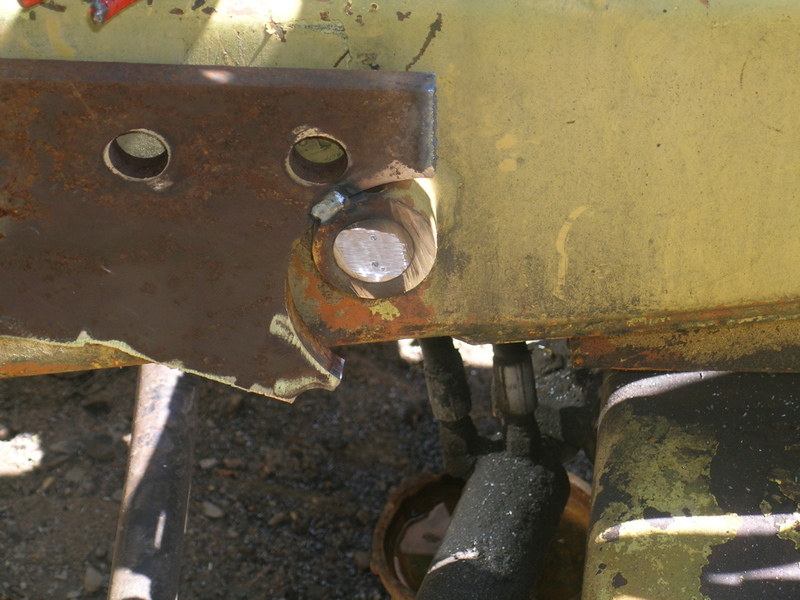 The good thing about buying machinery with known problems, is that you have to resolve those problems up front. As opposed to worrying about what might break while in service. 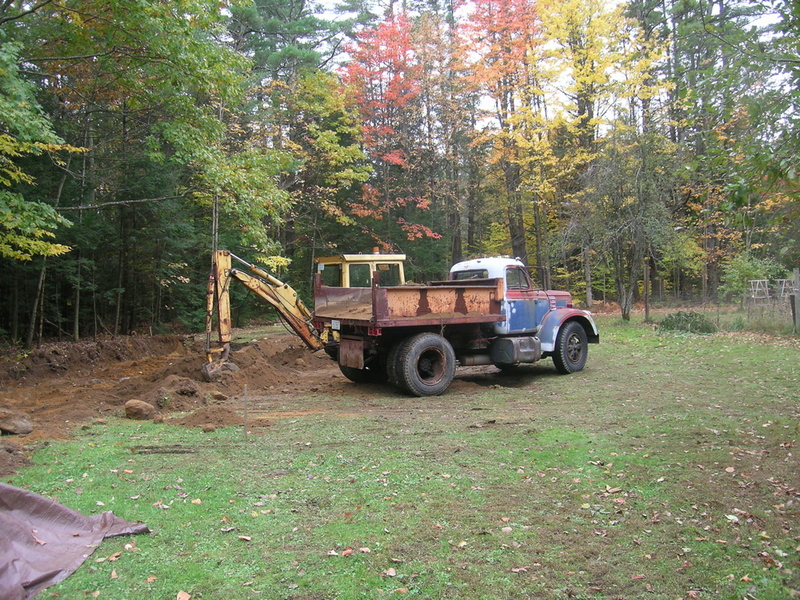 In the case of a septic system, you really don’t want to do major repairs to your machine, while the house goes without plumbing. (Even a big tank can fill up quickly). Similarly, if you have a sizable machine capable of doing a lot of work in a short amount of time, you’ll have a hard time moving it if it dies on you. 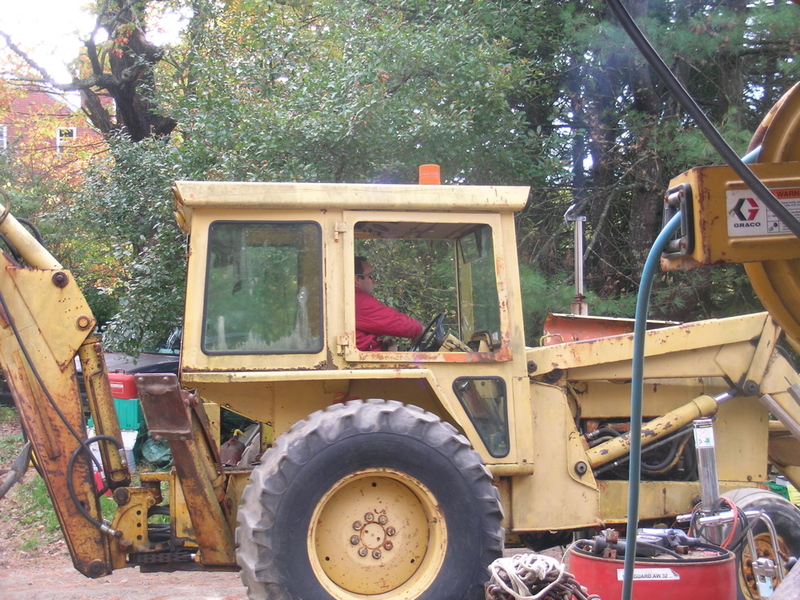 Old machinery of unknown provenance has a habit of breaking in locations where repairs are inconvenient. 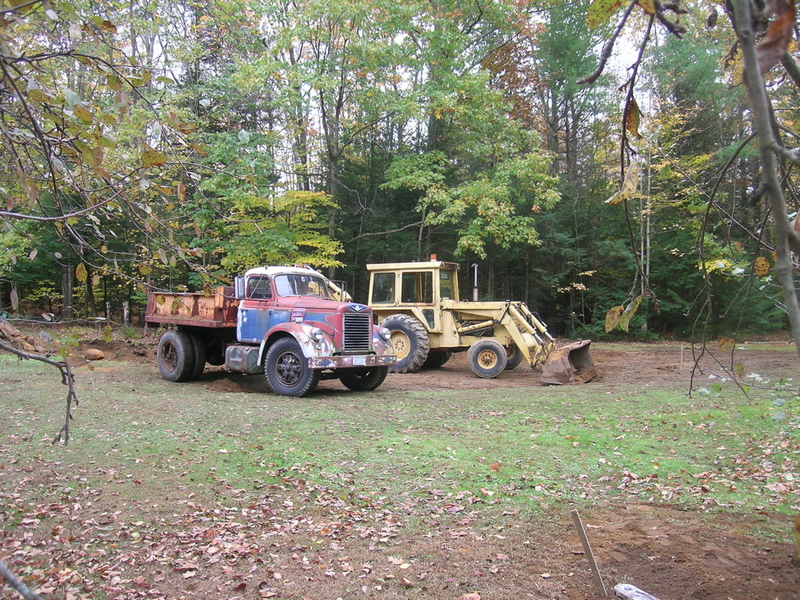 We found a ’72 Ford 6500 within hauling range. 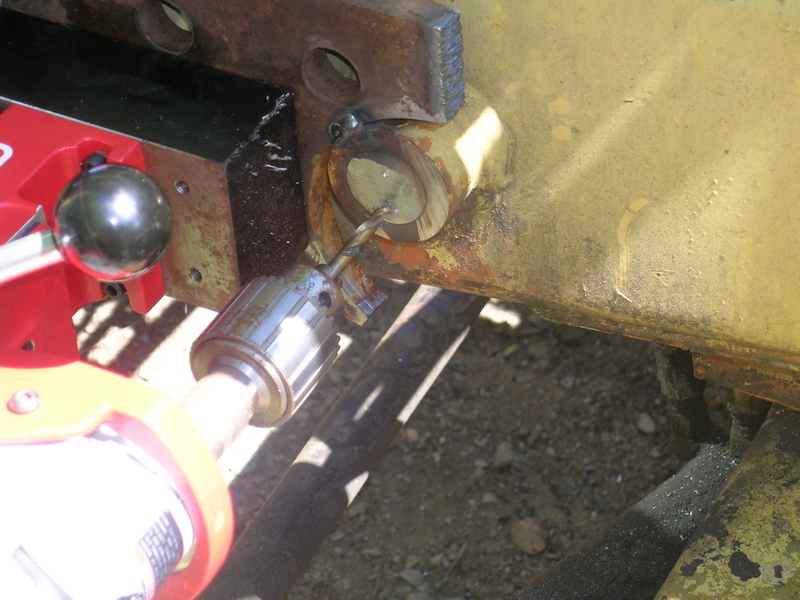 The primary issue, other than use and abuse, was that while the machine started and ran well, it would not move, nor would the hydraulics function. 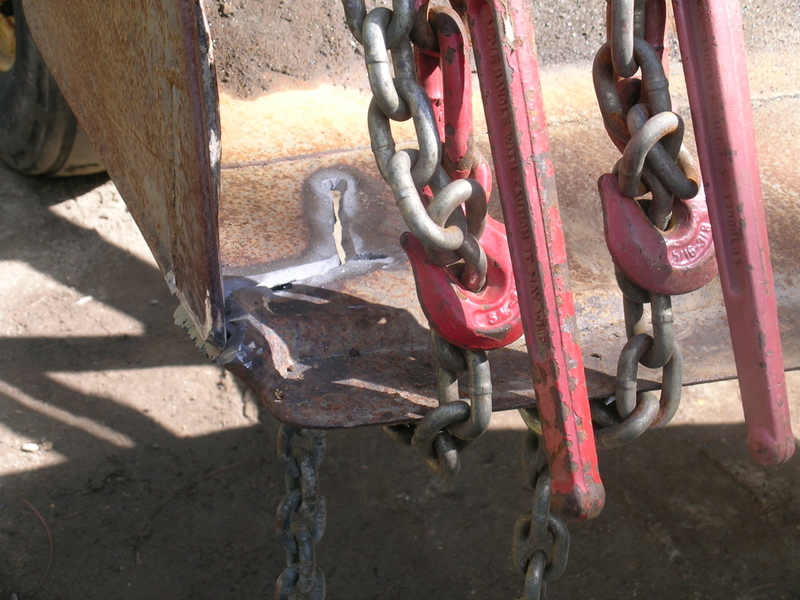 The rest of the machine had obvious flaws, but in general it looked serviceable within the projected budget, so an offer was made, and a lowboy hired for the move. As an added plus, it came with a factory repair manual. 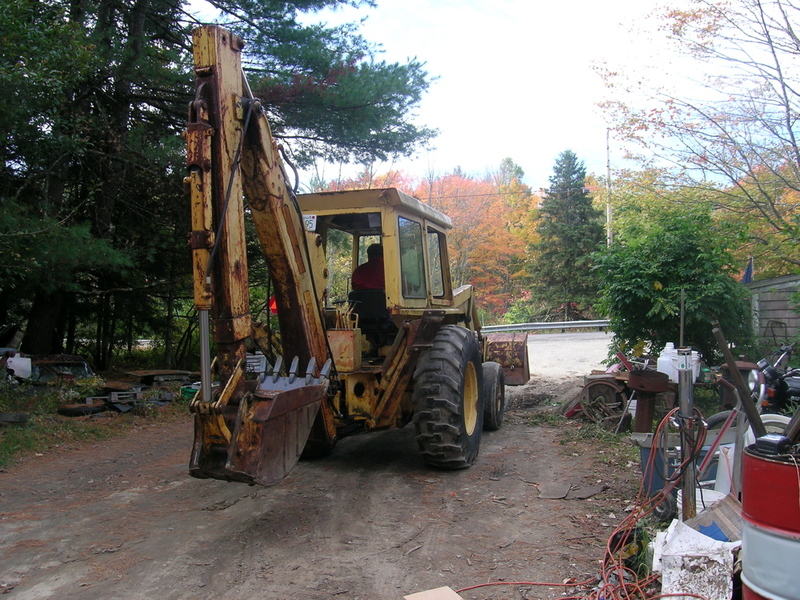 (It’s real heavy, it’s my brothers backhoe). 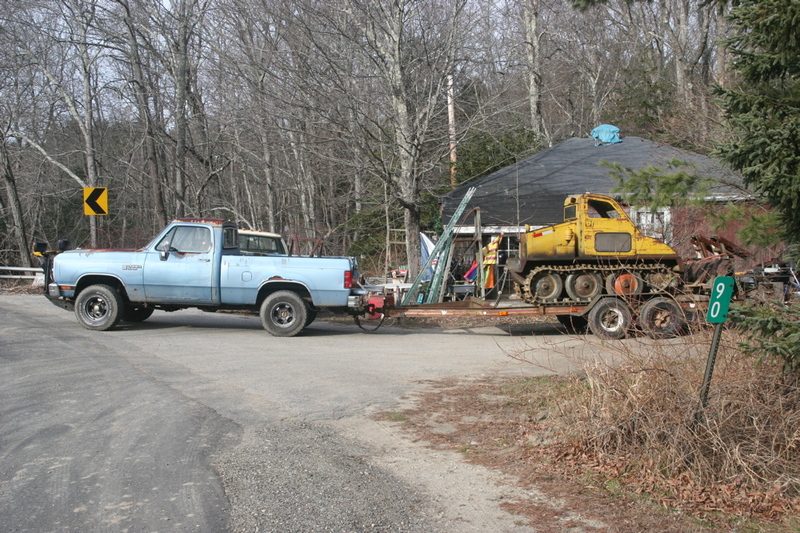 If you want a piece of yellow iron to look more impressive, park it in a small driveway. 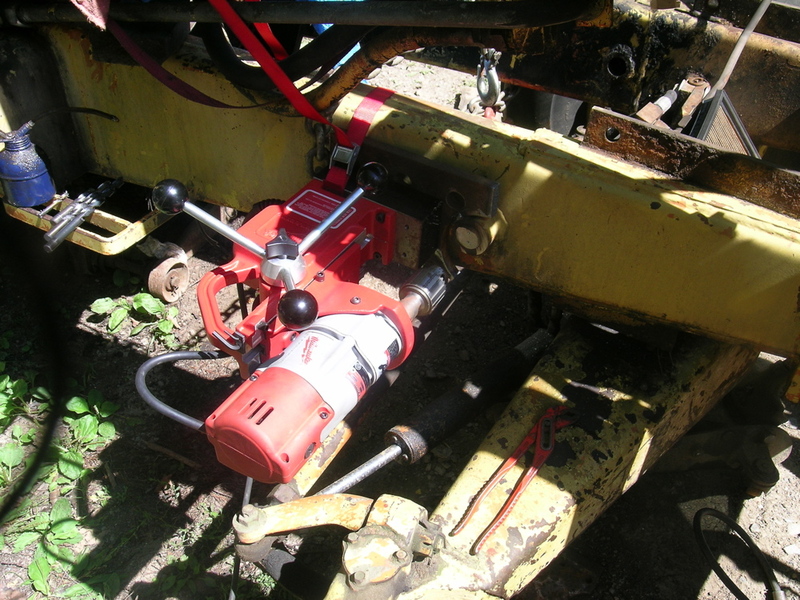 I used the V220 to pull the hoe off the lowboy, and shove it into the operating theatre. No big thing; pull the motor, replace the gear, move dirt. 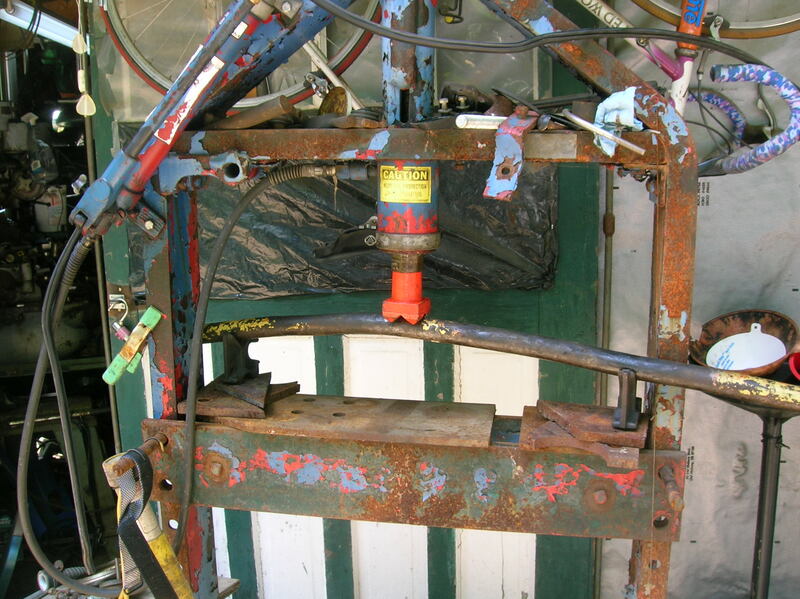 On this machine, the motor is held in place by the bellhousing, and by a set of pins run through bores in the frame. These interlock with the front of the block. 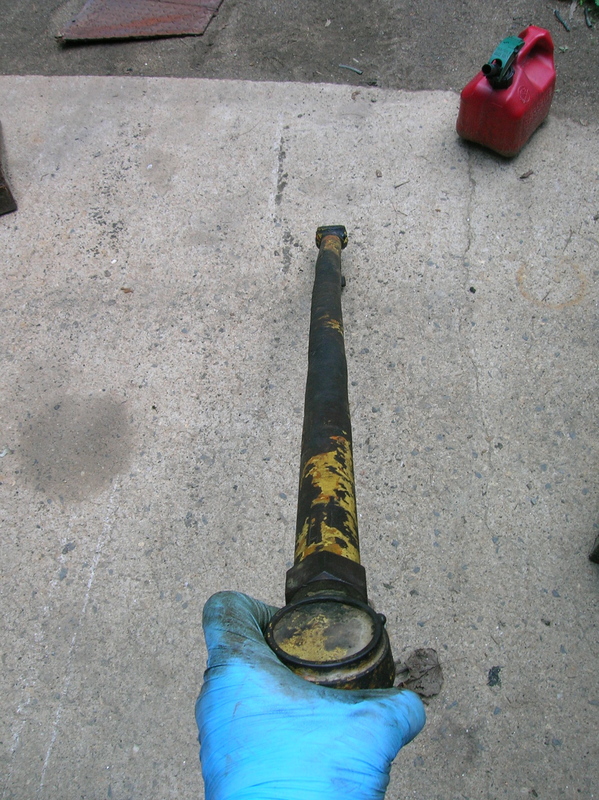 In theory, simply disconnect the engine from transmission, support the engine, pull the pins, and lift. 28 years of exposure, and the pins were not moving. I cut them off from inside the frame with a Sawzall, and pulled the motor with the help of the Hank truck. With the engine out of the picture, pin extraction could commence. The pin bosses are not perpendicular to the frame, so I tacked on some scrap to provide purchase and alignment for drilling. 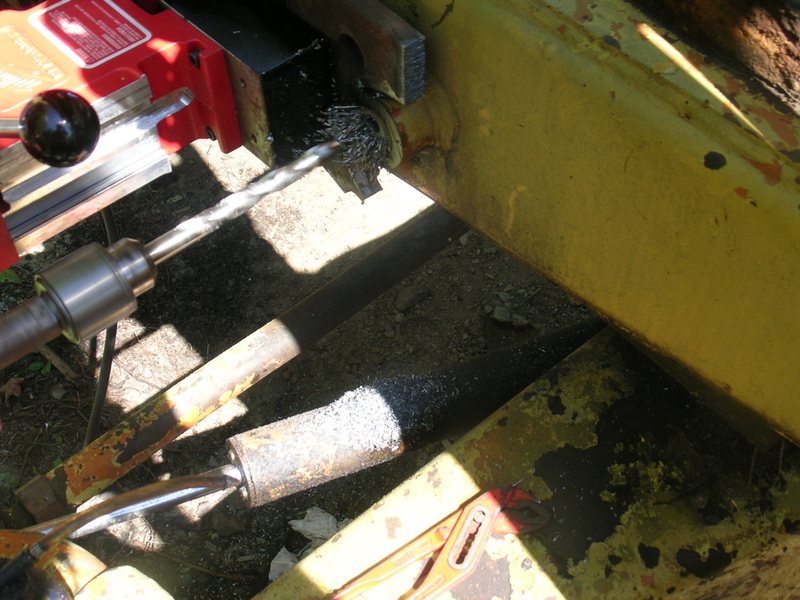 The length of the pin remnants exceed the travel of the drill, so three bits are needed, in addition to the pilot. Then you borrow one of these. First bit. I like to use screw machine length bits whenever possible. The shorter length tends to prevent wandering. 2nd bit. I used a cobalt bit for the heavy lifting, given the depth and material removal. 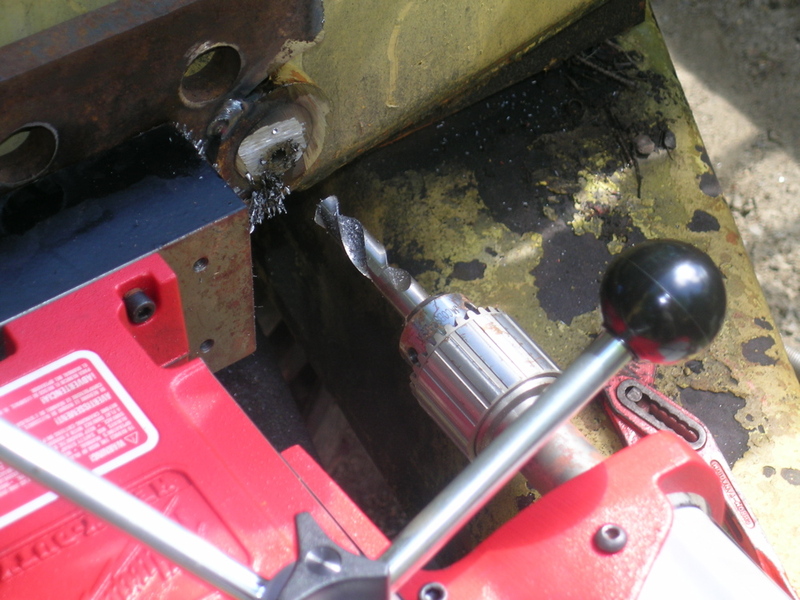 The last, longest bit only had to drill through 1/2″ or so, so I used standard HSS. And bring on the muscle. There was still a lot of back and forth involved. Sawing the uphill side was no picnic. Breaking the rust bond made quite a bang. The middle section was stuck in the frame. (The line is the saw cut). This machine is really one class size larger than the project requires, but the advantage is I have plenty of room to work. 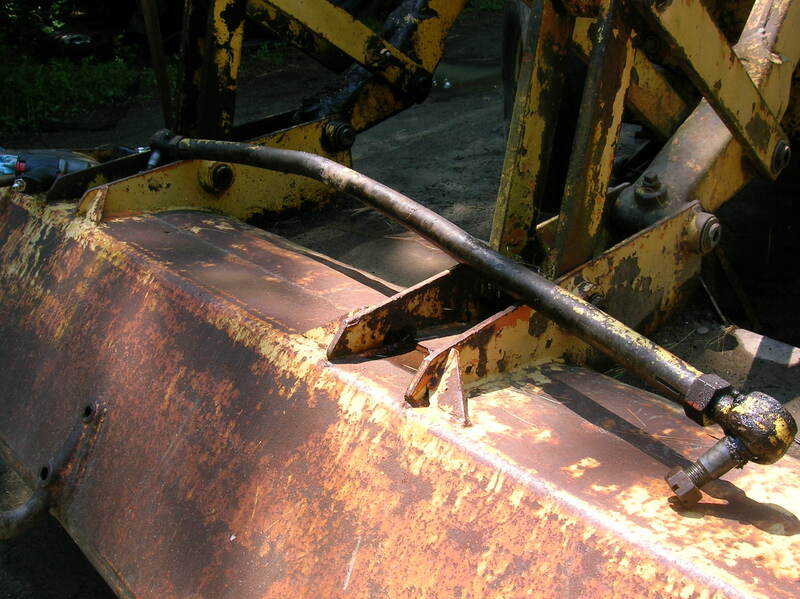 Many smaller hoes have a loader frame that seriously obstructs engine work. 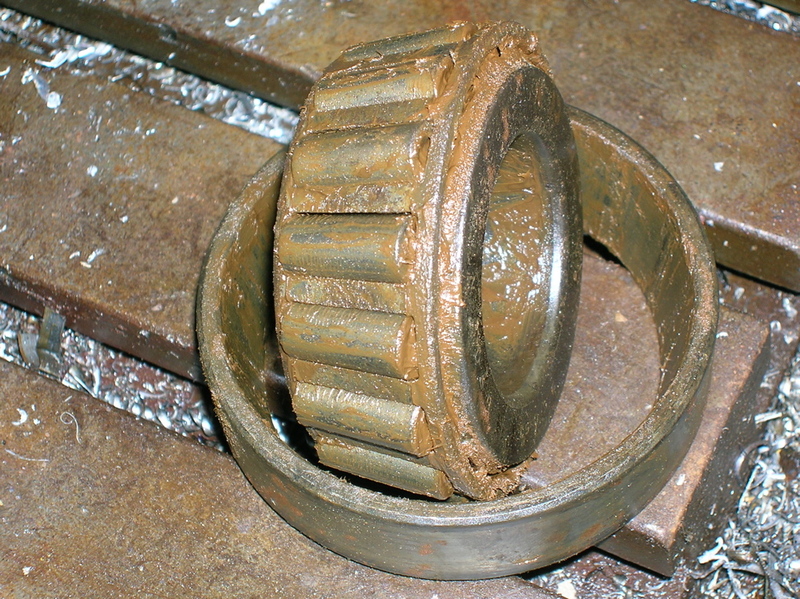 Remains of the fiber drive gear. The dealer was looking for around $900 for the gear kit, which consisted of a gear, steel bearing ring, a set of bolts with locking compound, and a packet of sodium silicate. With the realization that the transmission was a Clark product, a call was made to Minn-Parr, and a genuine kit arrived for roughly half the price. Age, and lack of centering, led to the demise of the ‘original’ gear. 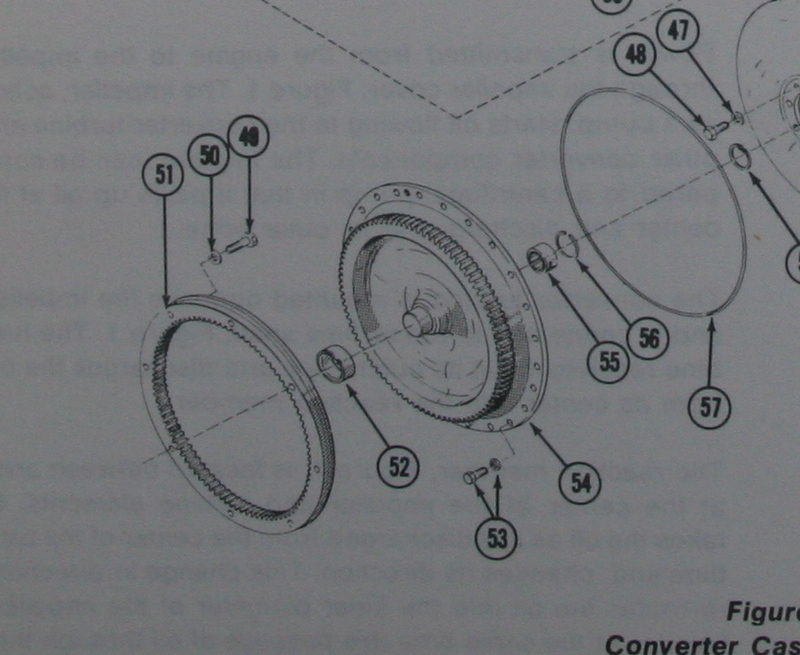 The torque converter snout should be centered in a bushing in the flywheel. 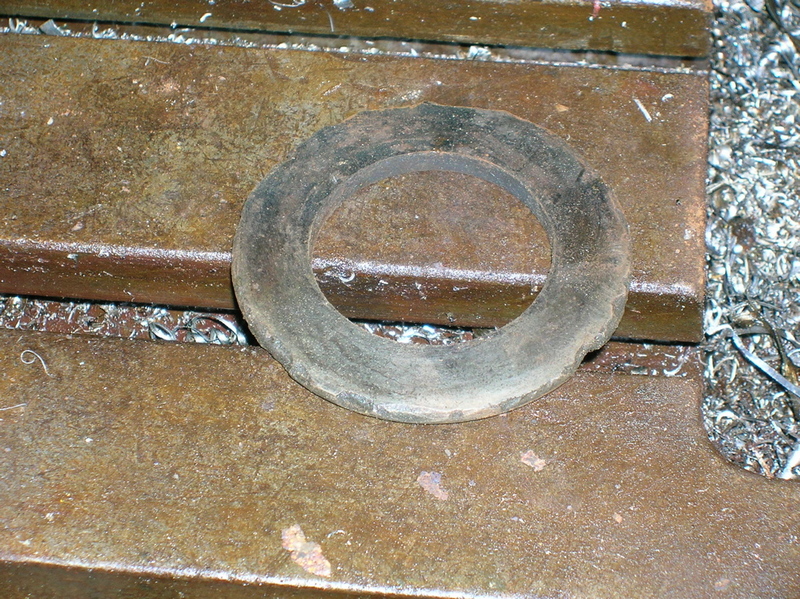 At some point previously, this bushing (#52 in the previous manual scan) had worn out, enlarging the hole in the flywheel. 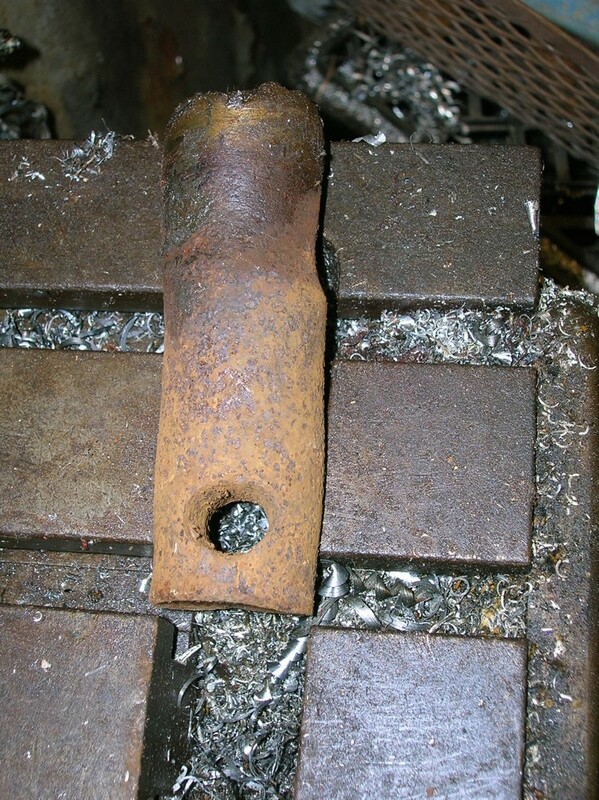 At that time, a repair bushing had been hammered onto the converter, presumably to account for galling, etc. 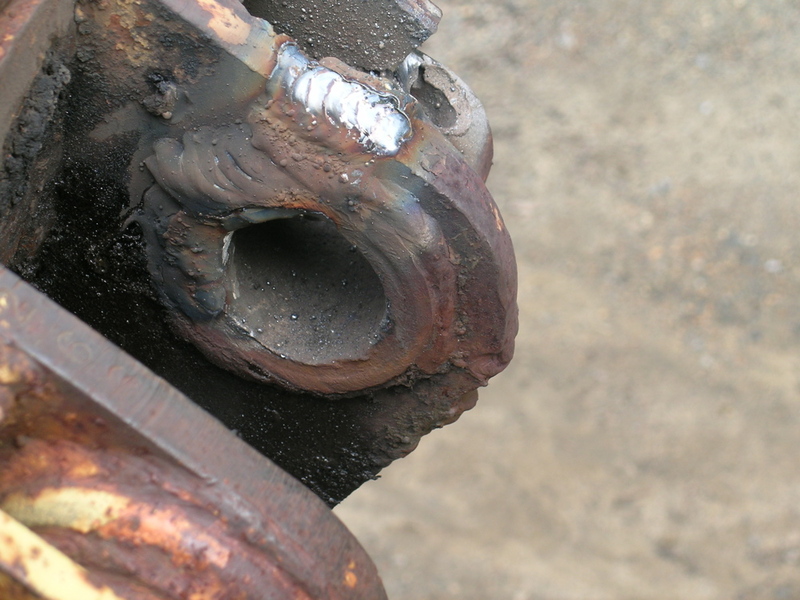 This bushing was significantly undersized for the bore in the flywheel, and so the fiber gear was pounded to death over the years by the rolling weight of the converter meshing the teeth in a way that was not intended. I don’t have a heat treating oven, and have never tried to heat treat parts. 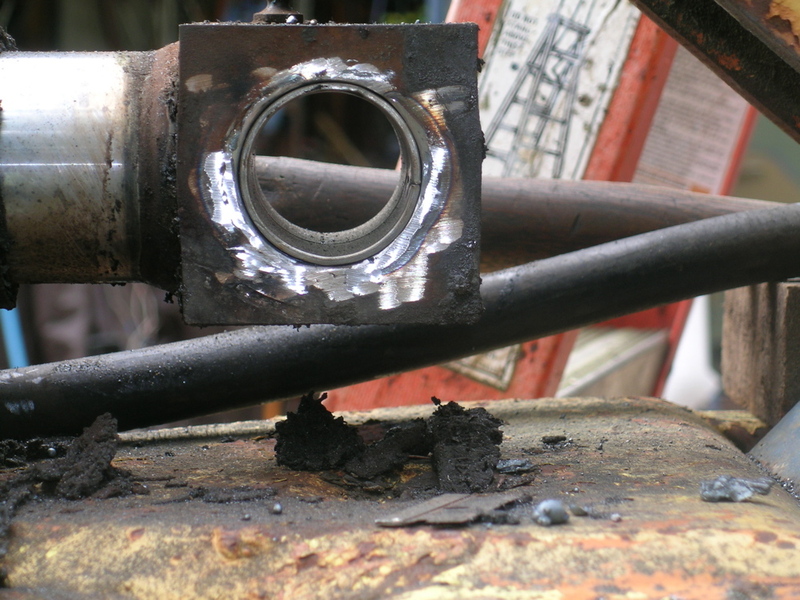 While it would be simple enough to make (and install) a bushing made of common steel, the cost and hassle of doing the repair again wasn’t appealing in the event it didn’t work out. If and when the hoe moves on to another home, it wouldn’t be nice to stick the next owner with that kind of hassle. 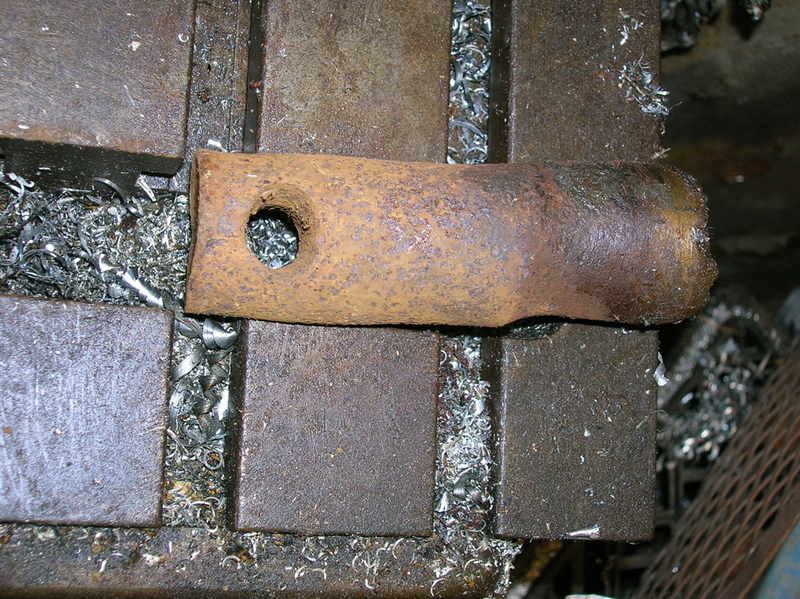 The original bushing, fiber gear, chunk of tool steel from which a new bushing was fashioned, and the driver for installing the new part. 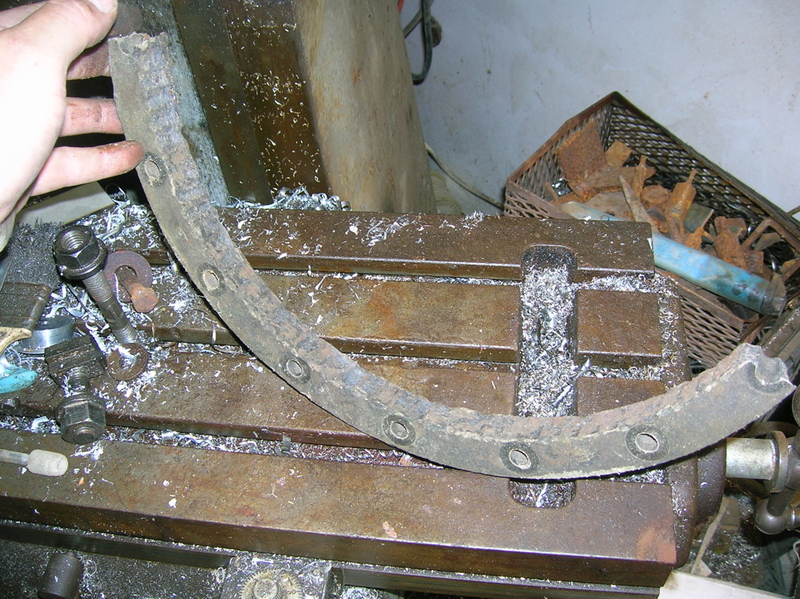 A local, (retired) machinist was coaxed into making a bushing. 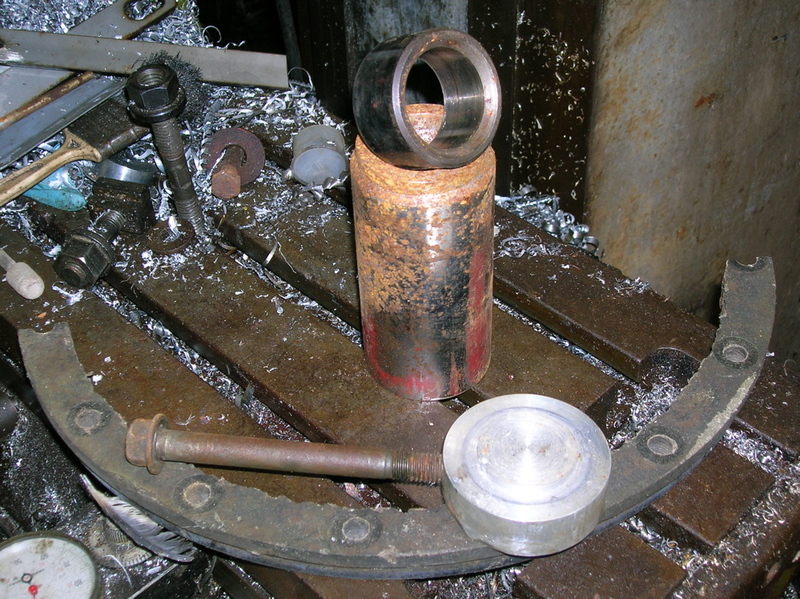 The flywheel bore was measured, and the new bushing diameter sized to allow several thousandths clearance. 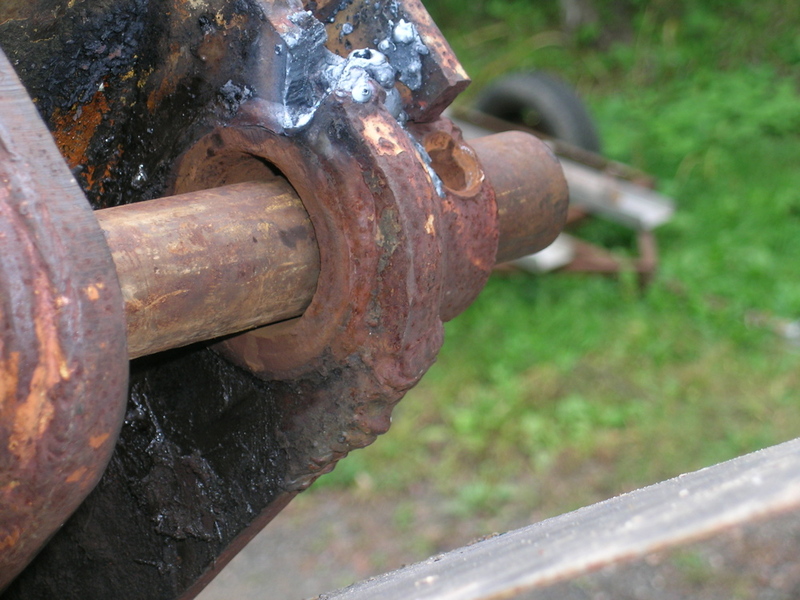 A one-off bushing wasn’t particularly cheap, but you sometimes get what you pay for. The motor install might have been one of the easiest ever, especially when one considers the weight, and the confines. I think it meshed with the transmission on the first shot. It was a one man, one old truck job. The crane on the Hank truck tends to ‘settle’ under load, particularly when the load is heavy, and the weather is warm. 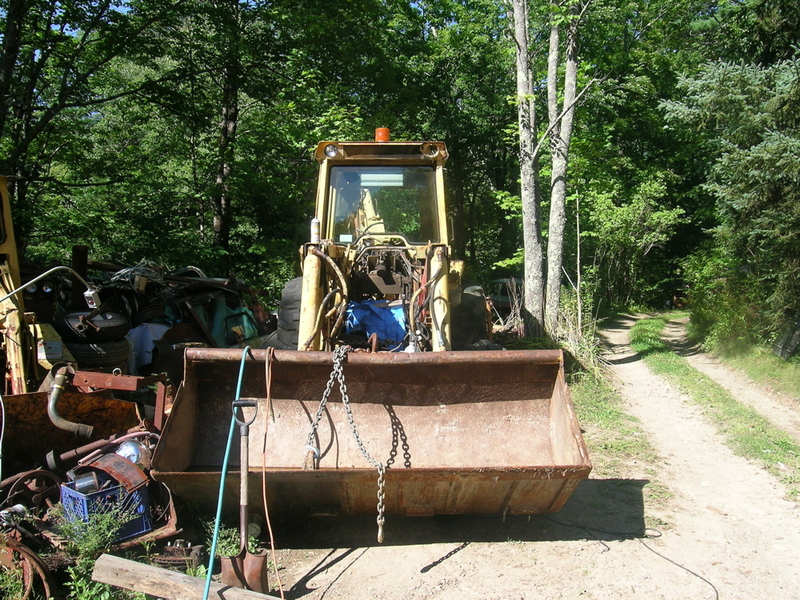 The settle rate was such that I could get off the loader, wiggle the engine into place as it drifted down, toss a bolt or two into the bellhousing, unhook the chains, and then lift the crane before the bucket landed on the motor. 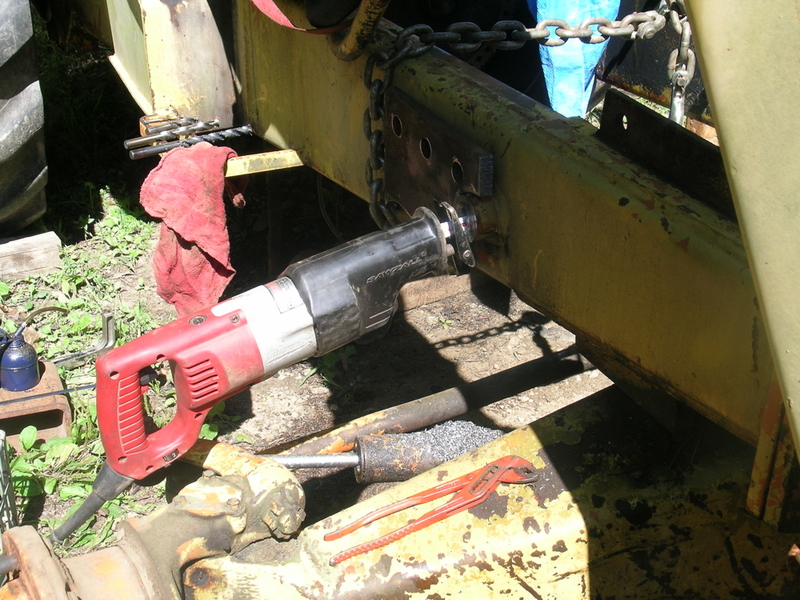 With the hoe moving under it’s own power, I moved onto the other repairs. Inner and outer front wheel bearings and relevant seals. 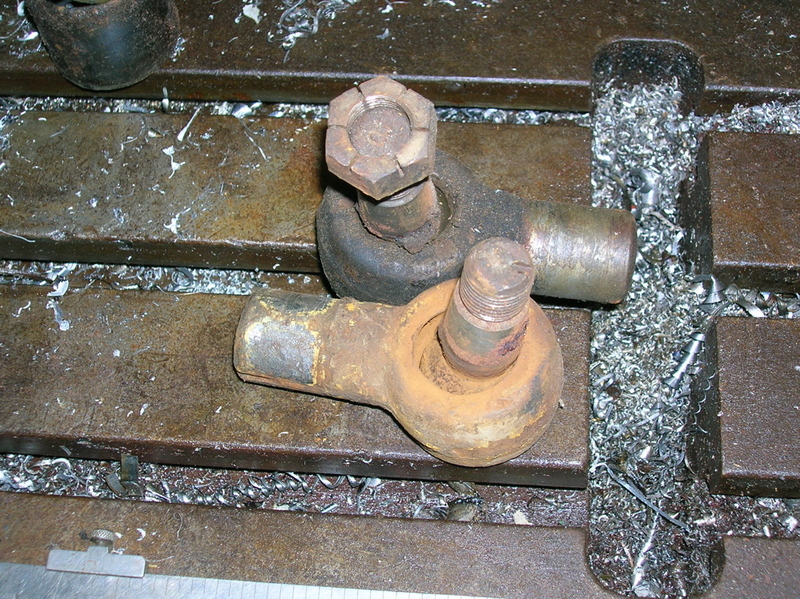 This race is all that remained of the left side steering axis bearing. Both right and left side were replaced. We only needed to road the machine about 4 miles, but with something this heavy, it makes no sense to skimp on the drivability and safety thereof. 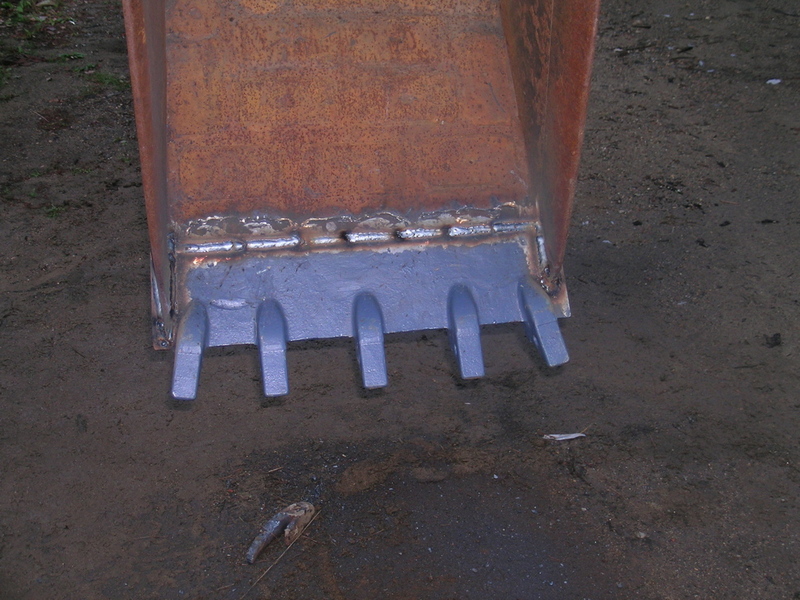 The main hydraulic tank is incorporated into the left side loader pillar. 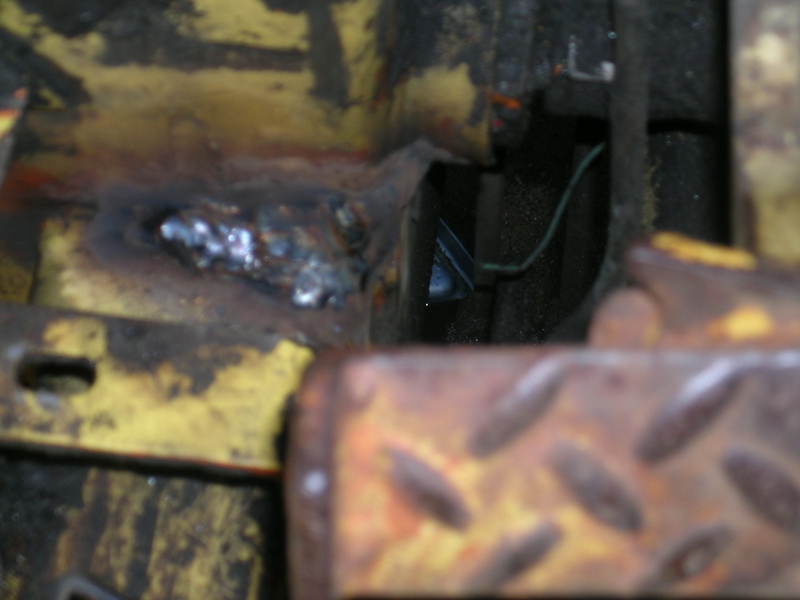 Either the welds were porous, or repeated loading led to frame flex and cracking. 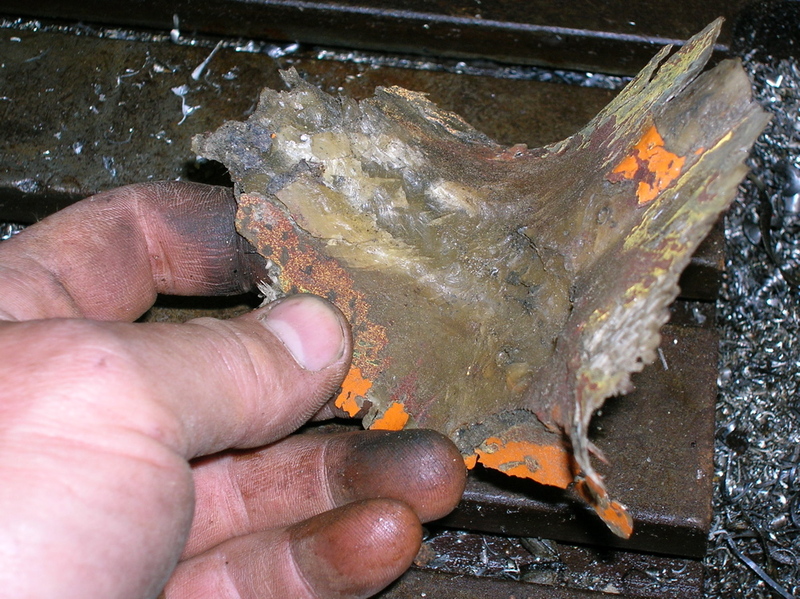 A (failed) repair was made previously with fiberglass and resin. 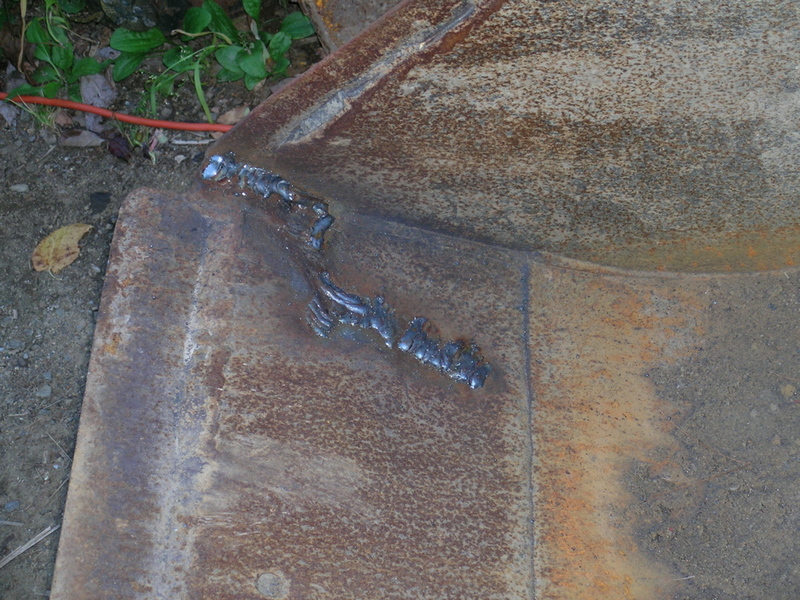 The original weld line is visible, curving through the middle of the patch. 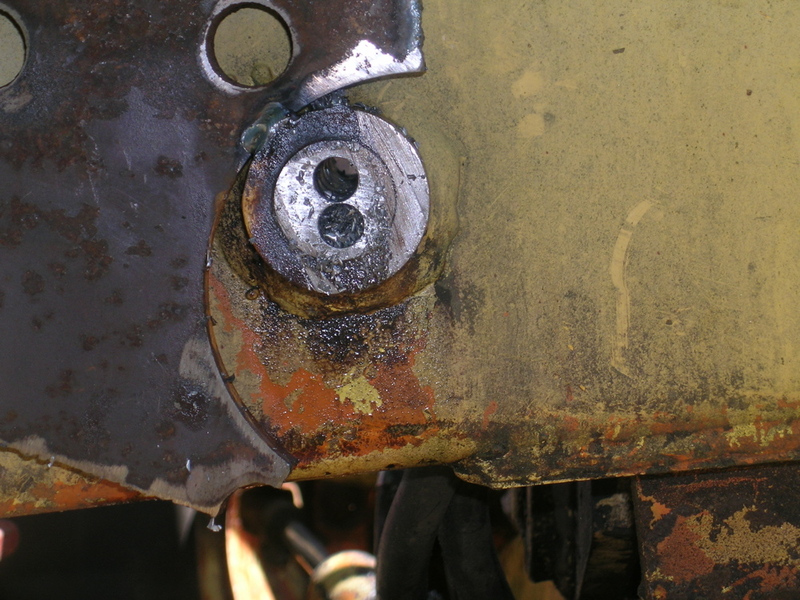 Drained the tank, spot blasted for prep, heated the area to burn off residue, and welded the crack, keeping heat to a minimum. I don’t think this machine was babied. The best option was to buy a new Hensley cutting edge with integral shanks. Funny how they look crooked. The bits were pinned on later. 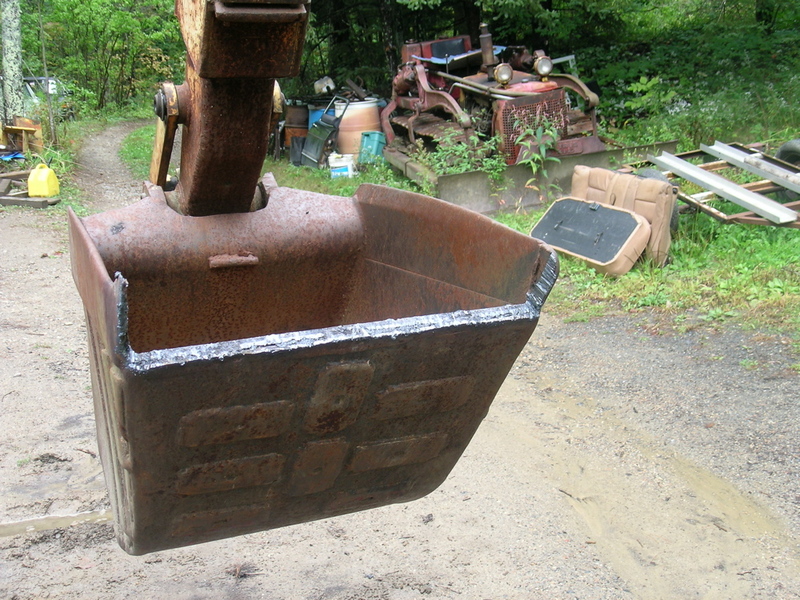 Torn bucket lip, gouged and pulled into place. 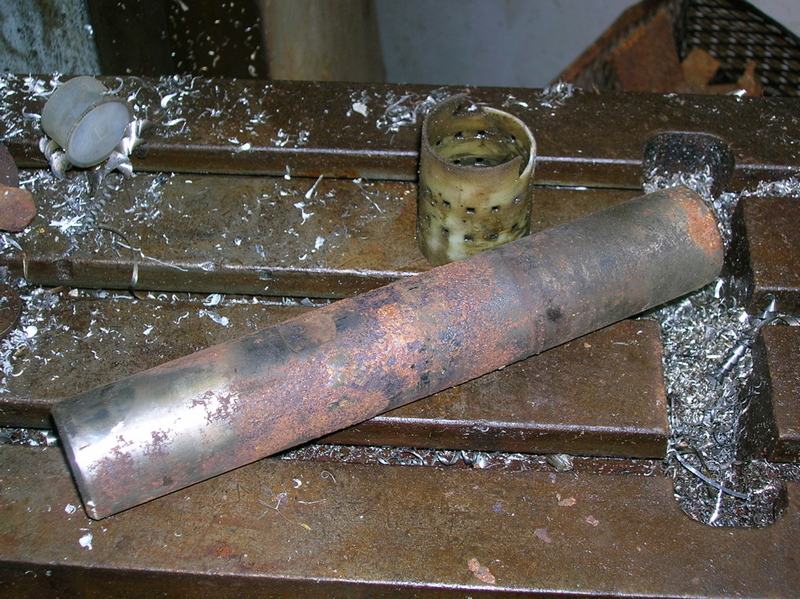 This is the pin ‘connecting’ the rod end of the stick piston to the stick. 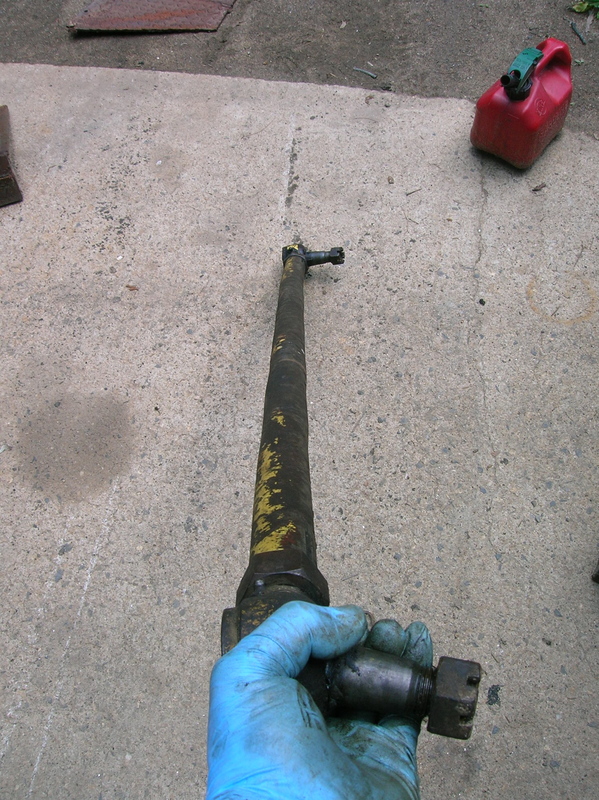 Too short to engage both ears, and one of the two bushings in the rod end was gone, presumably ground to pieces. 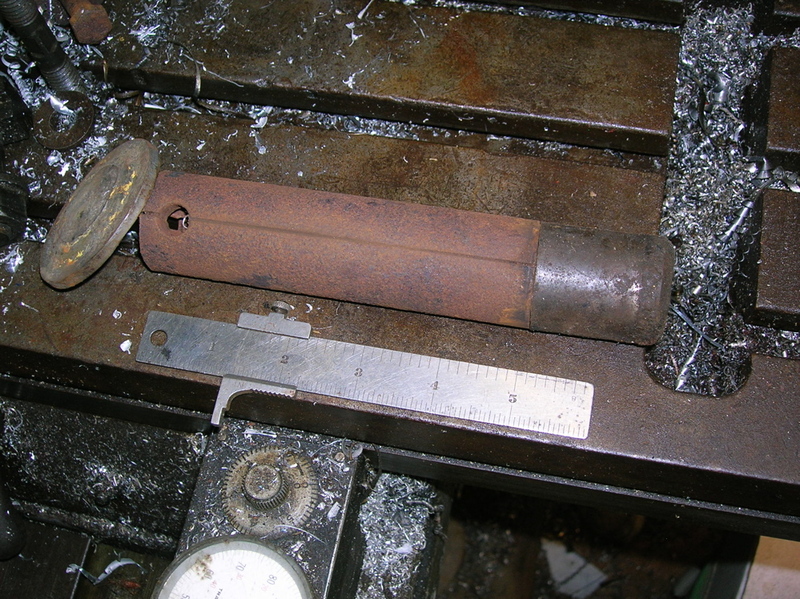 This pin is the correct diameter, which illustrates the wear in the bore. The major crack has been gouged but not cleaned. The build up for a ‘best possible’ hand grind. 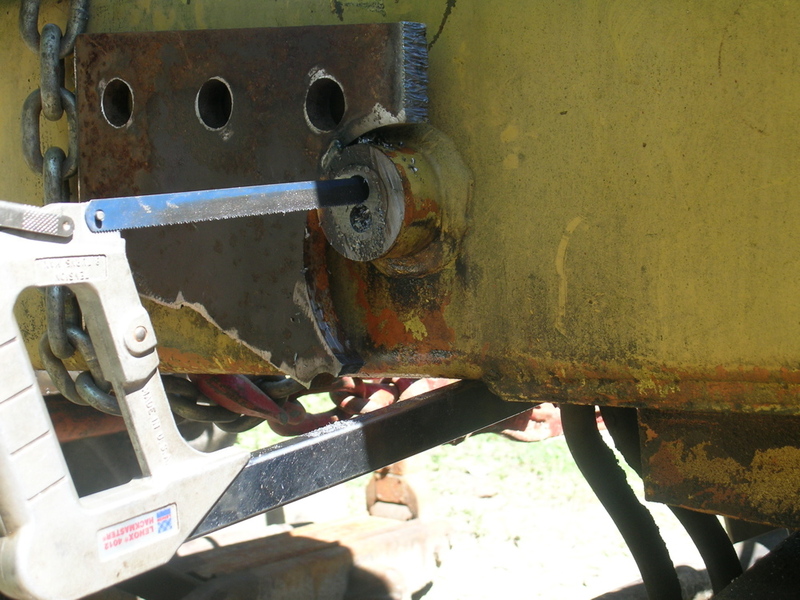 Similar repair to rod eye. Sooner or later this will need to be done correctly,removing the cylinder and boring on the mill; but for one septic system, it should be fine. At some point this pin will be replaced. 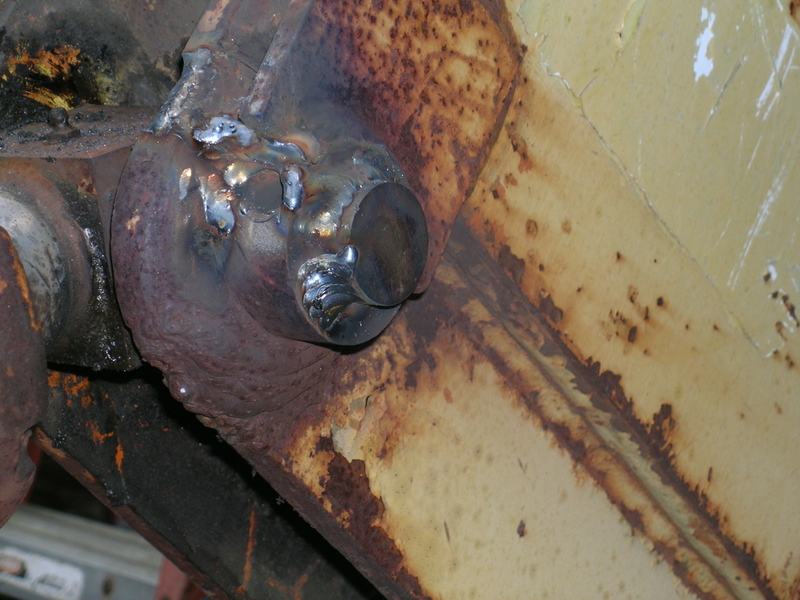 It is welded in on the outside of both ears with the hope of preventing further bore wear. 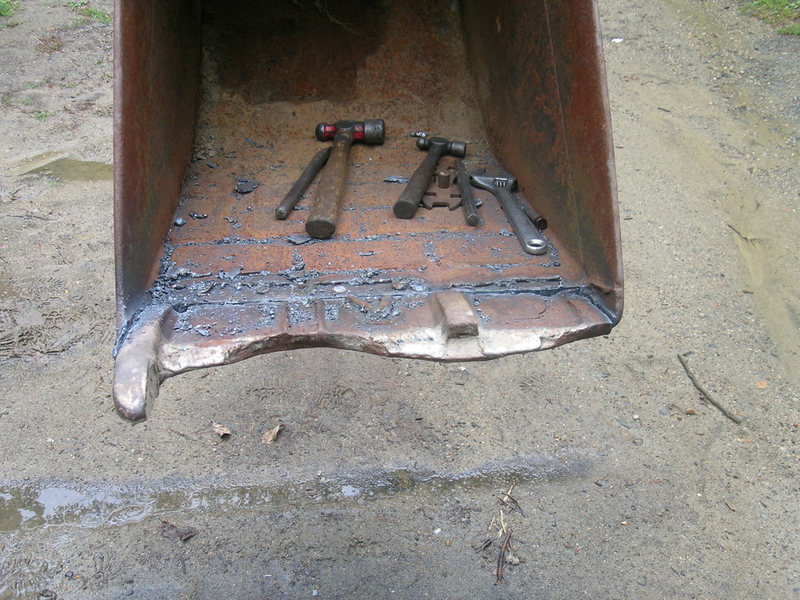 If it bends, the common steel will be easy enough to cut with either a torch or Sawzall. Filters, fluids, a few other details, and down the road we go. It’s amazing how close a shiny new car will get to the back of a swaying yellow monster meandering slowly down the road. One of the selling points for this machine is the operators area. There is enough room in the cab for a small barbeque, and visibility is good as well. Changing from dig to load mode is easy, with plenty of room for the operator to swing the seat around without banging into the cab and controls. The Bombardier was brought in to spread the septic sand. It worked well, though it was very easy to ‘washboard’ the grade, due to the short wheelbase and bogie configuration. After a number of projects, the hoe needs more work. 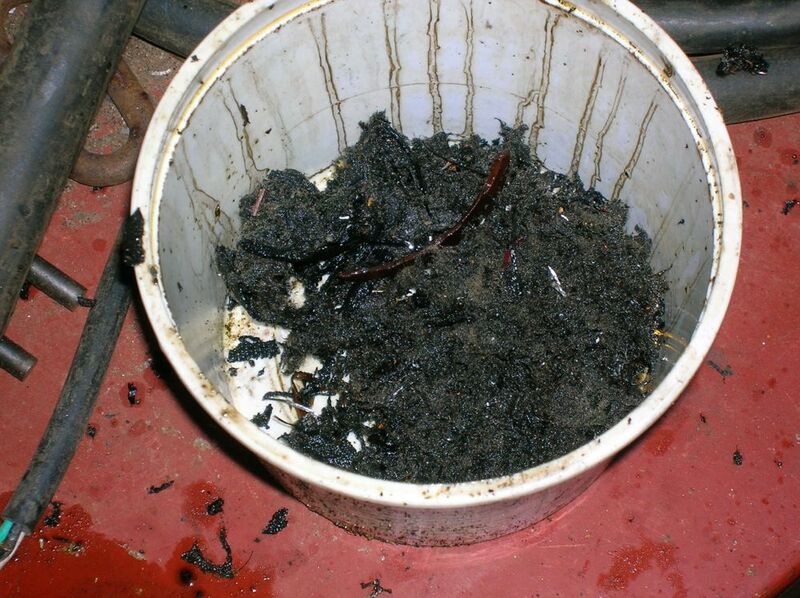 The right bucket cylinder is leaking excessively, as are the steering rams. 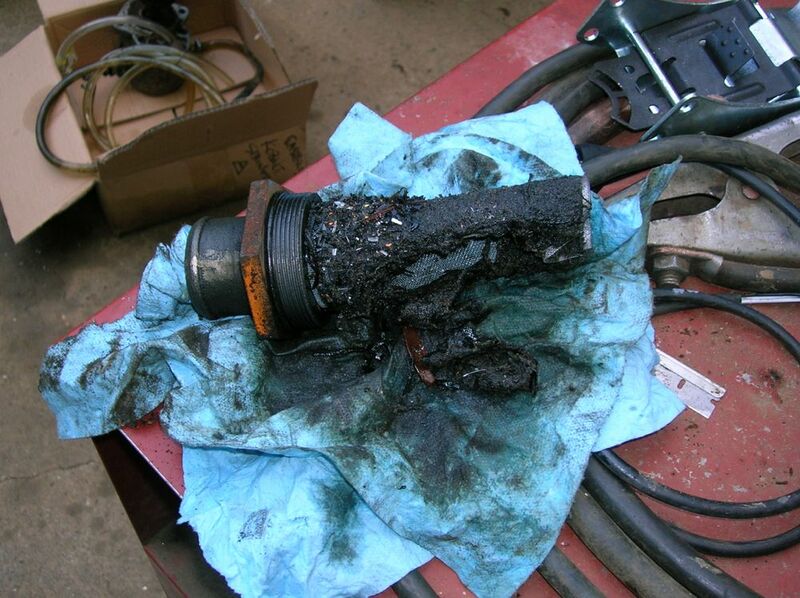 The main hydraulic pump is noisy, and the hydraulics are very weak. 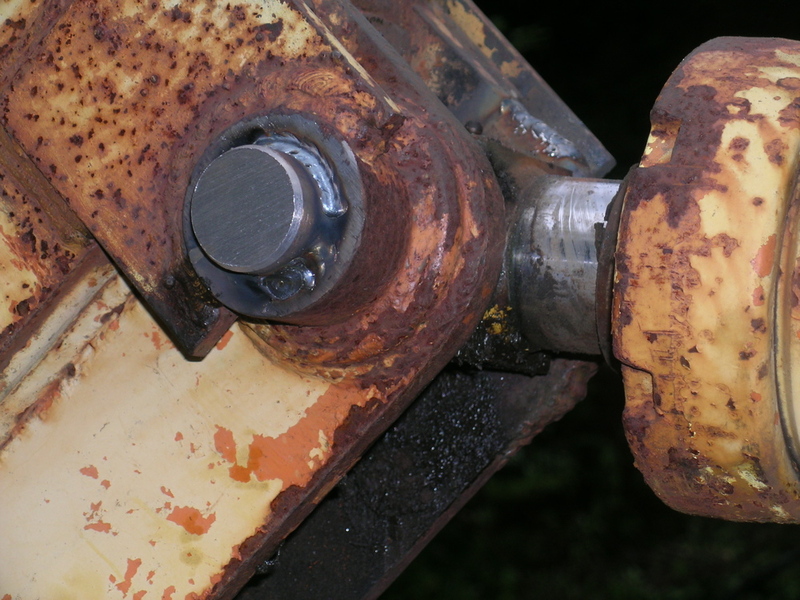 And roading is difficult, on account of the banana-shaped tie rod. As to the cause, apparently someone skipped over a large rock while loading, and said rock spent time getting to know the tie rod. The press was built with a hand wheel and screw mechanism. At some point that was replaced with a 20 ton ram. About 5 minutes after this photo, I went for one more tweak, and broke the right hand V block. I found the two blocks years ago at a yard sale, and I believe they were used for checking, but not affecting, shaft runout. Oops. 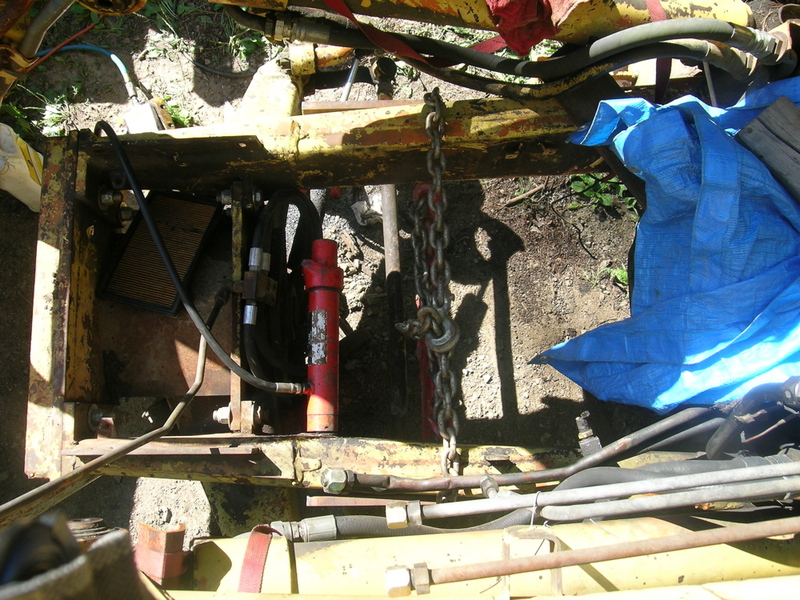 This past summer, we decided to get to the bottom of the lagging hydraulic system. We have the factory manual, and the time to raise the boom/stick and loader to full height is nowhere near what it should be. As in, it’s way slow. The pump pressure checked out, but the pump is noisy. The first thing to do is drain the reservoir, and change the return filter. 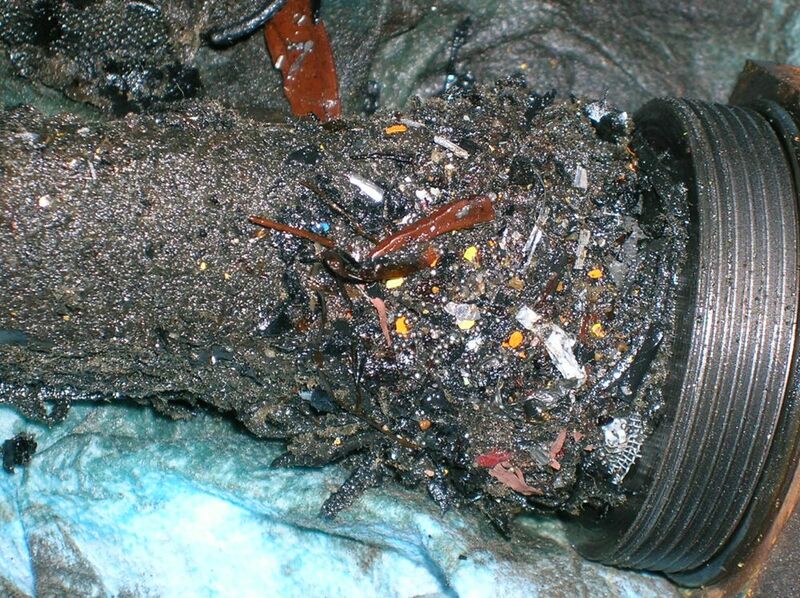 Neither revealed anything noteworthy, other than some colorful debris stuck to the filter. Pulled the pump, dismantled, and checked critical measures. All were within spec. I think maybe we’re on to something. Had to borrow a really big socket to get this thing out. 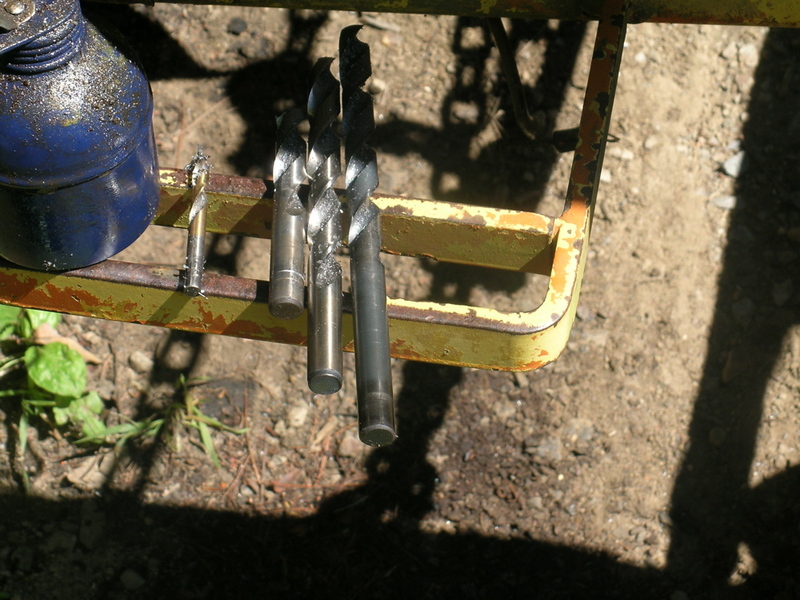 Not one to borrow tools, I later found a nice set of both 3/4 and 1″ drive sockets on Craigslist for future events. 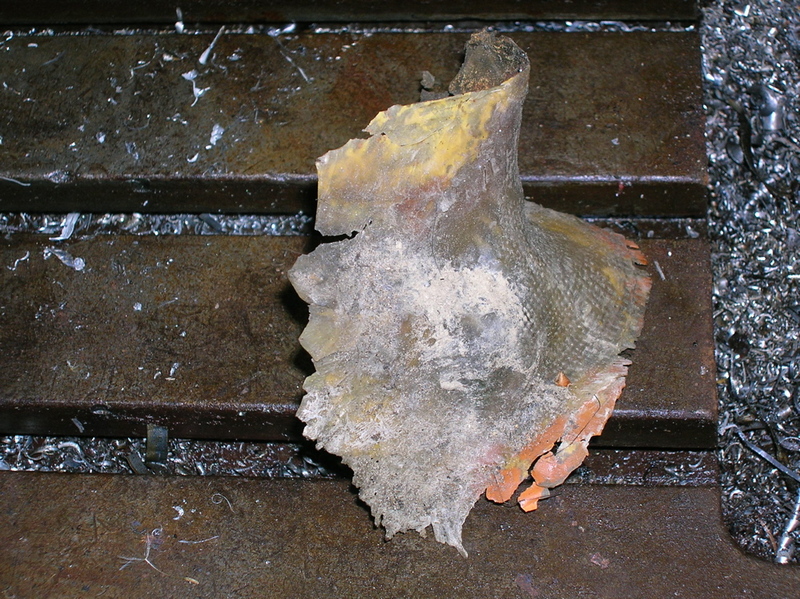 The remains of cylinder packing. 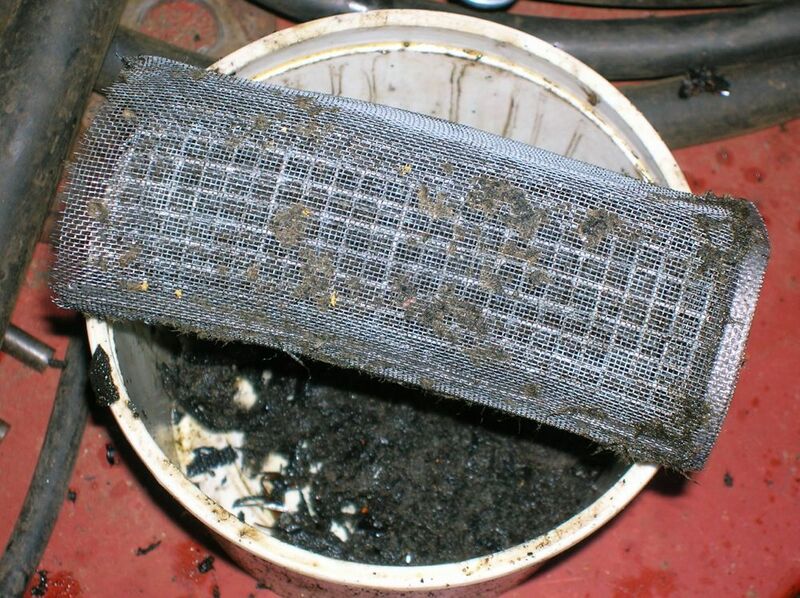 At some point in the distant past, the return filter had clogged, bypassing this crap back to the tank. What the screen should look like. More or less. Needless to say, the hoe operates a little better after this procedure.